Calvin had a grand mal at midnight, straddling day four and five since the last one. He fell asleep next to me after I gave him a dose of concentrated THCA tincture, woke back up at three o'clock repetitively humming, then wet himself and the bed and never went back to sleep. Instead, he kept sitting up, humming, and whacking his head on the padded side panel of his bed. Though we tried, Michael and I were so exhausted that we couldn't physically or emotionally manage his frenetic energy, so we bundled him up in his robe and secured him in his bed with his chew toys and Baby Mozart playing on CD. Last year Calvin had an average of just under thirteen seizures per month, with 4.8 of those being grand mal and the remainder being complex partial seizures. In the two previous years he had slightly fewer seizures and an average of 4.25 grand mals per month, though on a much higher dose of his benzodiazepine, clobazam, aka Onfi. This, our first month of what I was hoping would be a better year than 2017 on a variety of levels, Calvin has already suffered four grand mals and eight partial complex seizures. I can never be sure why one month is better or worse than another. I rack my brain and tweak his meds and personally diagnose his rashes and research their origins and investigate their treatments and rack my brain again and again for anything that might assuage the electrical storms that continue to invade his head. For instance, I wonder if Calvin's bad month is due to a paradoxical effect of the slight increase in Keppra, or perhaps a previous decrease in CBD. I wonder if this last stretch of his benzodiazepine withdrawal is proving to be more problematic than I had expected. I wonder if Calvin has another overgrowth of yeast in his gut (perhaps the source of the stubborn yeast rash on his face recently) which is releasing toxins into his blood that can trigger seizures and bad behavior (his behavior lately—and coincidentally since an increase in Keppra—has been exasperating like the bad old days.) Or maybe the culprit of Calvin's regrettable stretch is plain old puberty. My most recent thought is that I should test him for yeast and start him on a yeast eradication protocol and see what happens; in the past the treatment has correlated with fewer seizures and reduced hyperactivity. I am also planning to make my next batch of THCA cannabis oil twice as concentrated so that I can give Calvin some at night as opposed to the concentrated THCA tincture I made with a few milliliters of 190 proof organic cane alcohol added for more rapid absorption; perhaps even a tiny bit of alcohol is contributing to an inflammatory effect. Who knows, but I'm going to go with my gut. If those remedies don't help, as soon as Calvin is completely off of his benzodiazepine late next month, I think I'll try to procure or make some CBDA oil as a replacement for his CBD; something inside tells me it could work better. And if all that doesn't lessen Calvin's seizures I may have to consider going back to pharmaceuticals, an idea that I loathe but one that I probably shouldn't completely dismiss. To add insult to injury, all of this is happening while I am trying to make progress on my memoir, write the blog, walk the dog, clean the house (haha), advocate for racial and social justice, field one person's slightly deranged and ambiguous attempts at connecting with me, and cope with all of the bad news coming out of the White House and Capital Hill, not to mention lamenting daily reminders of how significantly delayed, disabled and ill my kid is. I know that surviving and remaining somewhat healthy in our kind of situation requires a fair amount of gumption; I've got a few dear friends who are virtually in the same boat. But survival also means that I need to step back and breathe deeply, count my blessings and my child's good days rather than focus on his bad ones, nap when I am weary, eat better, get outside more, laugh off others' sour moods, insults, antics and badgering, and live happily in the moment, like Calvin—who better than anyone—teaches me to do. 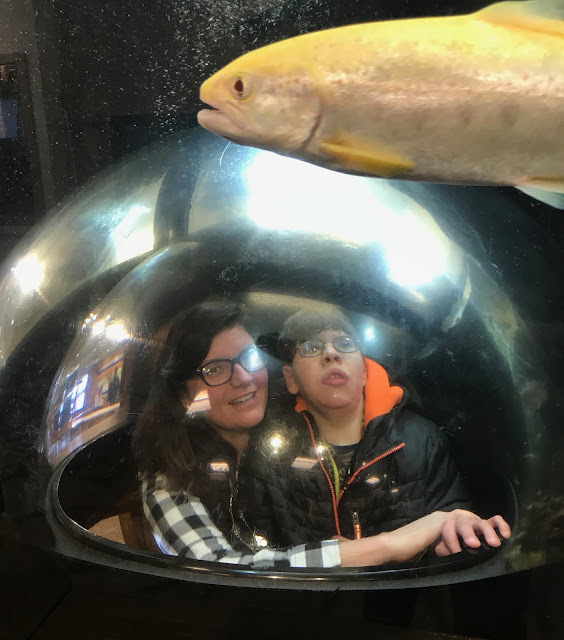 Calvin and his teacher, Siobhan, inside a fish tank bubble the other day.